When a raw area resulting from surgery is too wide to simply stitch together (direct closure) and just letting it heal in by itself would take a long time and also result in unacceptable scarring, the Plastic Surgeon’s two main approaches to wound closure are Skin Grafting and Flap Repair. This method involves identifying somewhere on the body where skin can be taken (donor site) and then transferring that skin and securing it to the area where it is needed (recipient site). As the graft depends on the body growing blood vessels into the graft to nourish it and keep it alive, the recipient site must have a good enough blood supply in its raw surface and for this reason a skin graft will not work if applied directly onto the exposed surface of bone, cartilage or tendon: in this situation a Flap Repair will be necessary (see below). There are two types of skin graft: a Split Skin Graft and a Full Thickness Skin Graft. The skin is made up of several layers. If skin is carefully shaved off an area (the donor site) without going right through the deepest layer, the donor site will heal itself. If the graft is taken very superficially, healing occurs quickly and well, whilst after a thicker partial thickness (split) skin graft is harvested, healing takes commensurately longer and is more likely to leave a noticeable mark. Common SSG donor sites are the thighs and arms in adults (and the buttocks in babies and young children – for instance when treating burns and scalds), the donor area being wrapped in a dressing for approximately 2 weeks before being inspected and then redressed weekly until sufficiently robust to be left open. The remaining reddish pink mark will take up to 12 months to fade to its final mature state. SSGs can be harvested under local anaesthetic, an anaesthetic cream often being applied an hour before surgery to numb the area so that no injection is required at the donor site at all. Donor sites can be quite sore for about 3 to 4 days after surgery, however, requiring relief with something like Paracetamol during that time. SSGs are either glued or stitched into place in the recipient area, almost always with a dressing on top, and are looked at about 5 to 7 days later to gauge the % of acceptance (graft ‘take’). A further dressing is usually applied for at least a week before leaving the graft exposed. SSGs are a reddish pink initially, fading over 9 to 12 months, generally ending up paler than adjacent skin. Their surface is often uneven and the surface area will often get smaller as the graft is unable to resist underlying contraction of scar tissue at its deep surface. Such contraction would cause a functional problem in some areas (eg if used to resurface an eyelid) and the cosmetic appearance tends to be less satisfactory than for full thickness skin grafts or skin flaps (see below). SSGs for skin cancer resurfacing are therefore more often used in less cosmetically sensitive areas and where graft contraction will not cause a problem (eg the lower limb). Against this, not only is split skin for grafting in plentiful supply and can therefore be used to cover large areas, but, because it is relatively thin, it is more likely to be successful than full thickness skin when the recipient area blood supply is poor to moderate. Furthermore, once the donor site is healed, it can be used again (a feature of great importance when treating extensive burns, for instance). A full thickness skin graft includes all the layers of the skin. Its advantage is that, unlike a split skin graft (SSG – see above), it does not contract (and may therefore be used on functionally sensitive areas such as the eyelid) and is also more likely to give a reasonable to good match of both colour and texture with adjacent skin. These features make FTSGs particularly helpful for repairing relatively small but cosmetically sensitive areas on the face, where the blood supply is rich and favours 100% graft acceptance. Naturally, the donor area of an FTSG would take a long time to heal by itself if simply left open, as it can only heal in from the edge, and grafts are therefore always taken from somewhere that can then be closed directly with stitches (eg in the groove just behind the ear). This limits the size of an FTSG to a relatively small area. Like SSGs, FTSGs are normally stitched into place, together with a special dressing, and are inspected for the first time after 7 to 10 days. A further dressing is often applied for another week and patience is then required while the graft settles and matures to achieve its final appearance after about 9 to 12 months. A skin flap is an area of skin which is completely freed up on at least 3 sides, so that it can be raised like a lid and turned into a nearby raw area to repair it. The base of the flap, the part which remains attached to the body, is where the essential blood supply runs in and out: clearly this must be sufficient to keep the furthest tip of the flap alive. The gap left behind where the flap has been raised is directly closed together with stitches and the skill is therefore in identifying a suitable area from which a reliable flap may be raised and used to good effect, without causing a significant problem at the donor site. This requires knowledge, vision and precision. 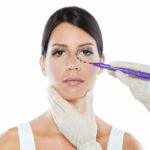 In practice, there are many and varied flaps which can be used, especially on the face where the blood supply is best, and, with a combination of imagination and skill (prerequisites for a good plastic surgeon), an excellent repair can often be achieved using this technique. In the wider context of reconstructive surgery, specific leashes of blood vessels supplying discrete ‘units’ of body tissue, such as skin or fat or muscle or bone or a combination of any of these, have been identified anatomically and are routinely isolated and used to accurately repair quite large defects. Sometimes the ideal unit of tissue is situated too far away to reach the target area, which might be on a lower limb where cover for badly broken bones is needed or in the mouth following extensive removal of a cancerous growth, for example. Under these circumstances, the leash of blood vessels is completely divided at the donor site and the whole unit of tissue is then transferred to where it is required and its blood vessels are ‘plumbed in’ to other blood vessels in the target area using microsurgery: this type of flap is referred to as a Free Flap.